Dog Rakes are designed to penetrate thicker dog coats and remove the dead hair closest to the body, also known as undercoat rakes. 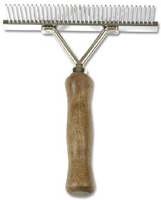 When using a dog rake do not exert to much downward pressure and comb in the direction of the hair. 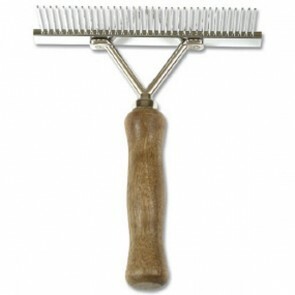 If you find a knot in your dogs coat, it is advisable not to use the undercoat rake to untangle the knot, but use a slicker which is also available on this website. Rakes: 5 stars out of 5 based on 0 user reviews.